This entry was posted in Case Studies on January 9, 2018 by Kay Tappan. I love this film for so many reasons (and if you want more, check out Font Men, above). It does a great job of illustrating the Modernist and Postmodernist socio-political climates and their respective effects on design. The film also addresses the question of whether the medium should be the message, or, as designer Tobias Frere-Jones points out, the type should merely be a “crystal goblet,” serving only to pool and organize information. This entry was posted in Lecture Outtakes, Public Relations Visual Communication and tagged elements of design, font men, fontmen, graphic design, helvetica, type, typeface, typeface font, typography, typography fonts, visual communication design on September 22, 2014 by Kay Tappan. I’m looking forward to an exciting and productive semester. On this site you will find course updates, lecture outtakes, lab material covered each week, and other visual communication miscellany. Feel free to leave comments but make sure to email me regarding assignments, clarification, or any other important questions or notifications that you might have. 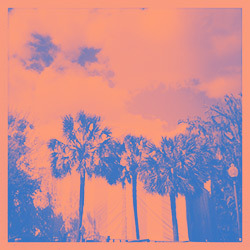 This entry was posted in Lecture Outtakes, Public Relations Visual Communication and tagged by kay tappan, public relations, University of Florida, visual communication, visual communication design on August 26, 2014 by Kay Tappan. Bic’s Universal Typeface Experiment has garnered a lot of buzz of late. Users can upload a digital sample of their handwriting; it then becomes part of a collective, singular typeface, as the name implies. Viewers can explore results using filters such as age, gender, and country. While I agree with Allen that it’s a smart move, my reason for this sentiment is entirely different. In fact, it’s the “tangible product” bit that could lead Bic down the already-trod path of crowd sourced disaster. Crowd sourcing is fun; we all want a part in the play, and the proliferation of social media and advanced desktop publishing capabilities have ushered in an era of unprecedented crowd sourcing. But a magic bullet crowd sourcing is not. Remember when Walmart sent Pitbull to Kodiak, Alaska? That’s to say nothing of design. Yahoo tried it with its logo refresh in 2013, then left our egos smarting after the unveil when it became clear that the final product did not, and never intended to, take into account our yays and nays. That’s a pretty safe bet, considering our collective scrawl could yield a less-than-stellar result. Let’s face it: the typeface will likely be, well, average. Takeaway: Don’t make any promises. The Universal Typeface Experiment is fun to use, with a clean interface and non-clunky interactivity. Sometimes participation is an end in itself, and a tangible product need not result. This entry was posted in Case Studies, Public Relations Visual Communication, Social Media and tagged Bic, Crowd Sourcing, crowd sourcing; crowdsourced design; crowd sourcing; pitbull kodiak; yahoo logo; yahoo logo redesign; logo design; universal typeface experiment; bic universal typeface, Universal Typeface Experiment on August 19, 2014 by Kay Tappan. Widgets allow you to customize your sidebar or other widget areas (these vary with theme). There are many to choose from (check out this WordPress Widget Guide). This guide has a list of many of the widgets, what they are useful for, and screen captures of what they look like (although appearance varies depending on how you configure the widget). Different themes have different widget areas. Go to the dashboard Appearance -> Widgets, and you will see the different widget areas. When you drag a widget into a certain space, it appears in that area on your site. Sometimes it just takes a lot of experimentation to see what looks best. At the bottom of each widget, you can expand the “visibility” option and choose which pages that widget appears on. You might also have to go into each page (from the dashboard) and check out which template is activated within that page; this can also affect whether or not widget areas appear on that particular page. Please reference the tutorial from the link above, and let me know if you have any questions! This entry was posted in Public Relations Visual Communication, Social Media, Visual Communication Lab and tagged how to activate widgets wordpress, popular wordpress widgets, what is a widget, what is widgets, widgets, wordpress, wordpress sidebar, wordpress widgets, wordpress widgets tutorial, wordpress.com on March 26, 2014 by Kay Tappan. 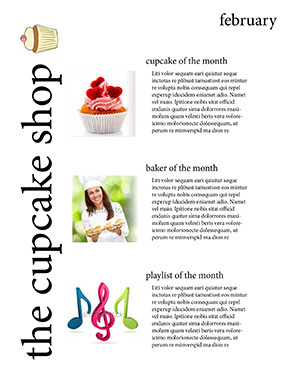 Below are the newsletter designs that the Spring 2014 Thursday lab students created for fictional clients. 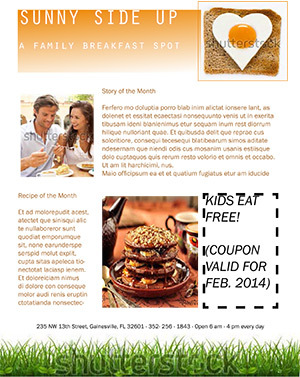 You can read more about the newsletter design assignment. Thursday Lab, 3 – 6 p.m.
Thursday Lab, 6:15 – 9:15 p.m. 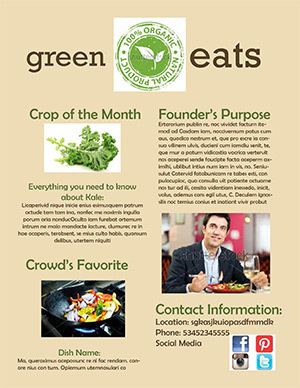 This entry was posted in InDesign, Visual Communication Lab and tagged in design, newsletter design, post by kay tappan, public relations, visual communication, visual communication design on February 17, 2014 by Kay Tappan. 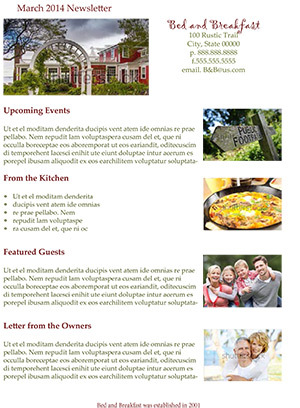 Below are the newsletter designs that the Spring 2014 Wednesday lab students created for fictional clients. You can read more about the newsletter design assignment. 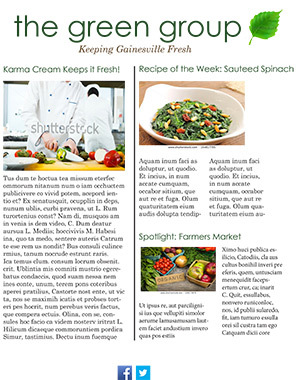 This entry was posted in InDesign, Visual Communication Lab and tagged in design, newsletter design, public relations, University of Florida, visual communication on February 17, 2014 by Kay Tappan.